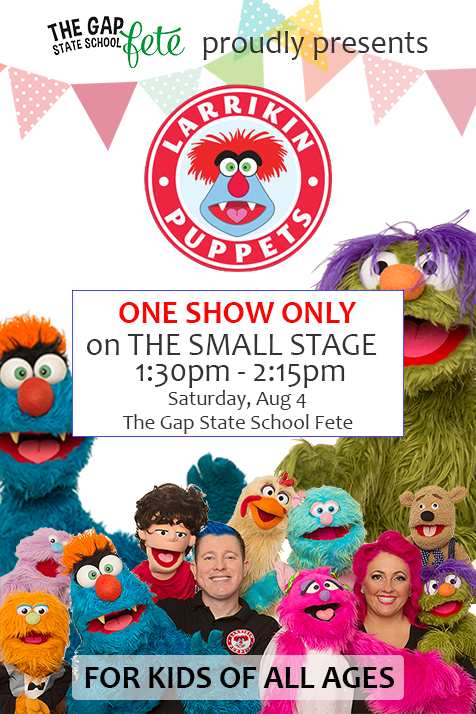 Popular Queensland children’s entertainers Larrikin Puppets perform a fun and exciting family puppet show for Fetes and Festivals that will keep people of all ages happy and entertained! 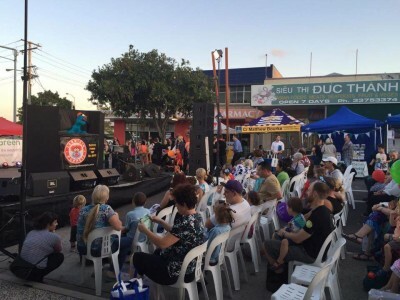 Darra Street Festival (QLD), October 2015. 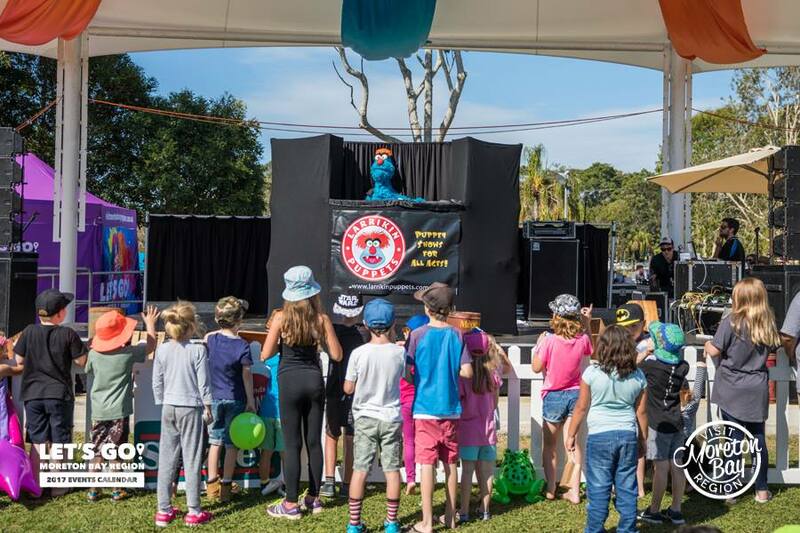 Brett Hansen and Elissa Jenkins with their gaggle of funny puppet characters provide top quality entertainment at fetes and festivals, council park shows & fairs, exhibitions and other showground events in and around Brisbane, Ipswich, the Gold Coast and Sunshine Coast. 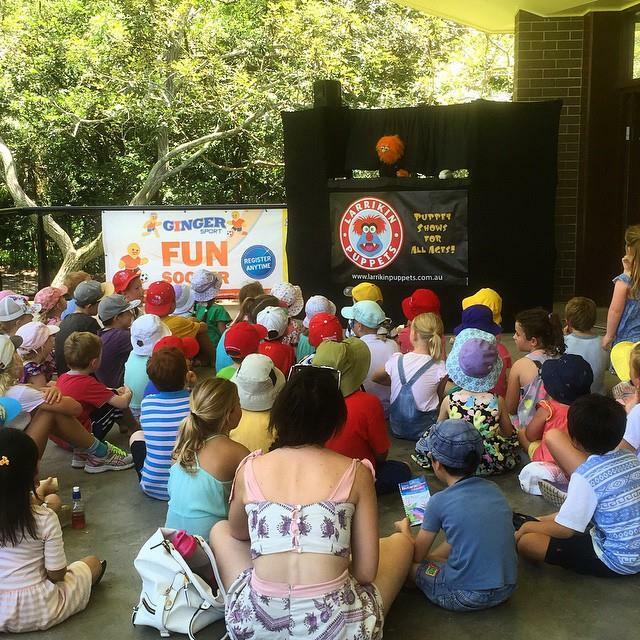 Crazy Kids School Holiday Fun at Brisbane Botanic Gardens Mt Coot-tha (QLD), April 2015. 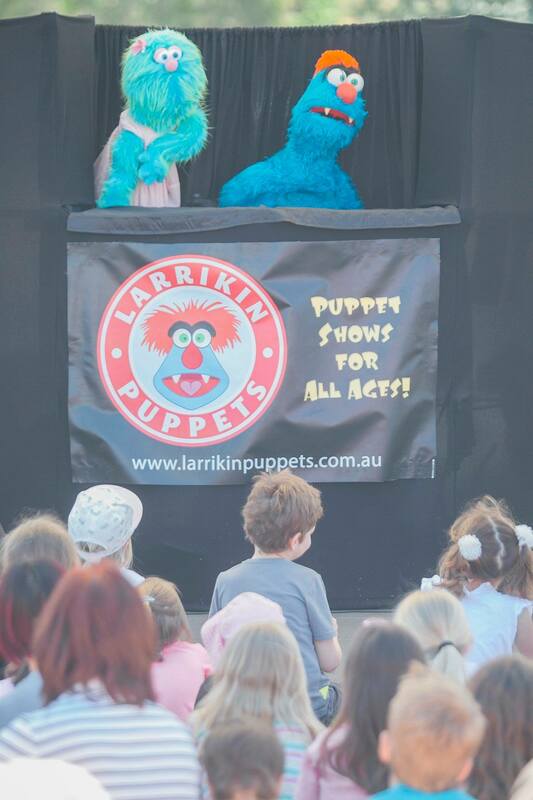 Larrikin Puppets have performed at Woodford Folk Festival, Woodford Show, Puppetry Arts Festival of Brooklyn (New York, USA), Cooroy Fusion Festival, Redcliffe Sails Festival, Ipswich Festival, Bundaberg Pageant of Lights, Gladstone Harbour Festival, Mary Poppins Festival (Maryborough), Goodna Jacaranda Festival, Gin Gin Family Frolics, Darra Street Festival, Brisbane Zombie Walk (RNA Showgrounds), Teddy Bear’s Picnic (Strathpine), Crazy Kids School Holiday Fun (Mt. Coot-tha Botanical Gardens), Little Days Out at South Bank, Hills Carnivale (Ferny Hills), Moorooka Festival, West End Festival, Chrome Street Fiesta (Salisbury), Caboolture Family Fun Day, Racecourse Road Community Christmas (Hamilton), Sunshine Coast Teddy Bear Fair (Buderim), Griffin Community Christmas, Caboolture Christmas Carols, Moorooka Christmas Carnivale, A Day For Duke (Bribie Island), open days, school fetes, church fetes and more. 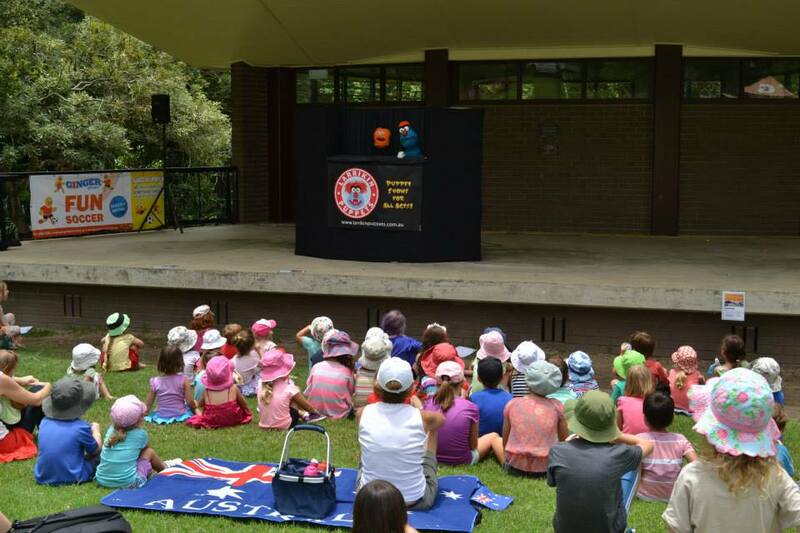 Crazy Kids School Holiday Fun at Brisbane Botanic Gardens Mt Coot-tha (QLD), January 2015. 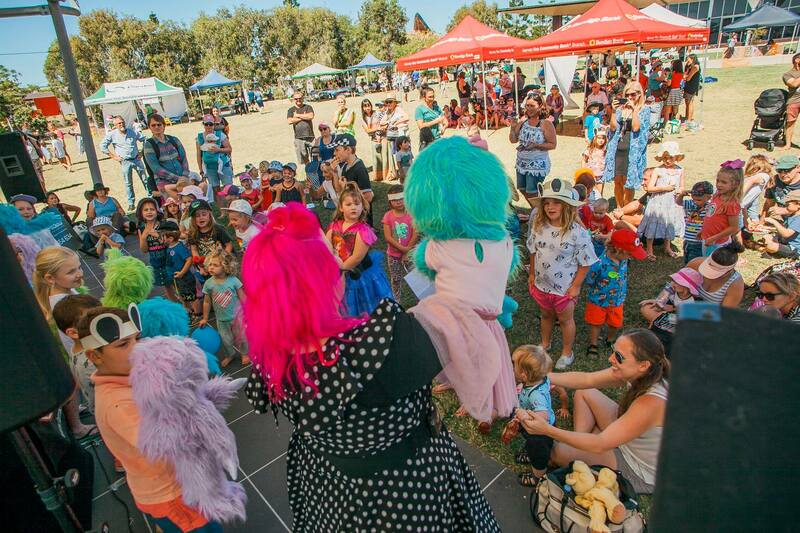 See below for full details on how you can include a puppet show at your festival or public event! 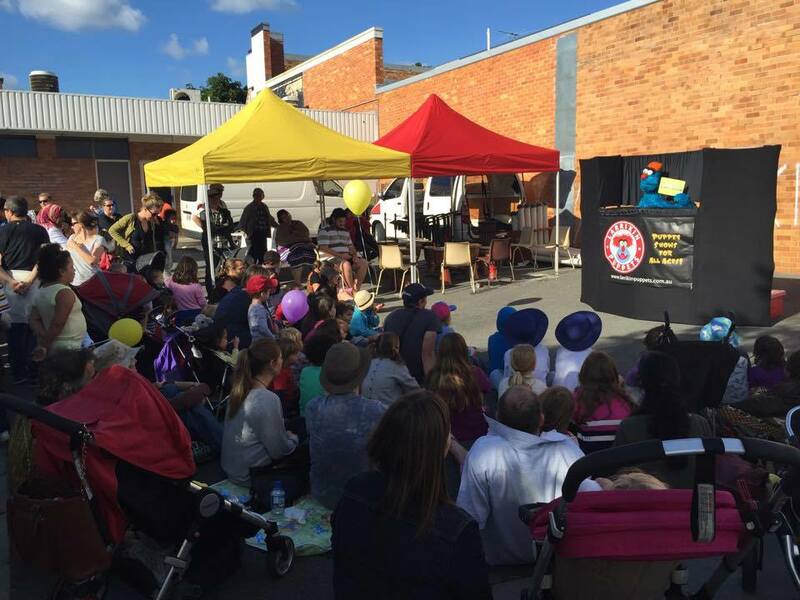 Larrikin Puppets festival puppet shows are $550 per show. 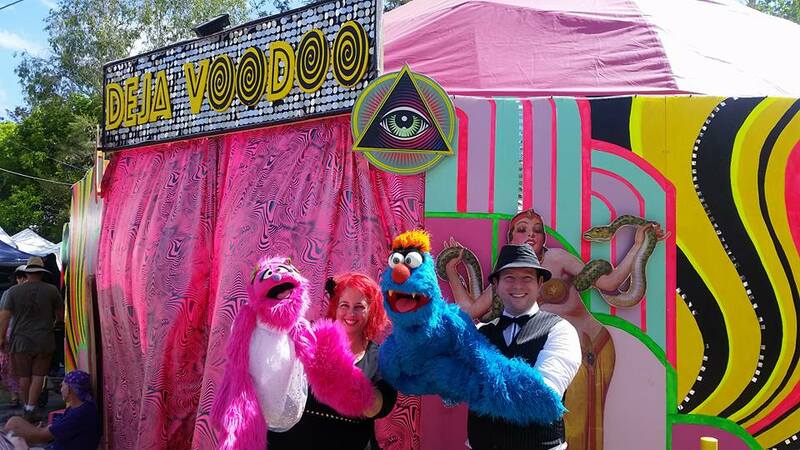 Additionally, some festivals choose to have some roving puppetry as well, which is $90 per hour. However, for more than one performance combined with some roving, we can do a deal for you. Contact us here to discuss. 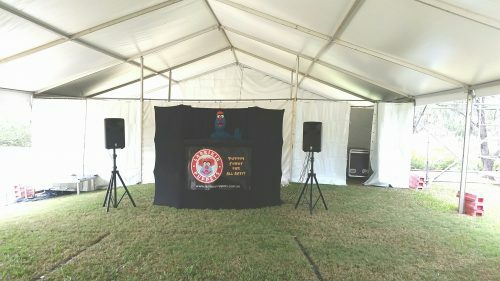 Teddy Bear’s Picnic, Hervey Bay (QLD), September 2018. 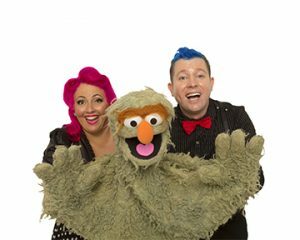 Suitable for the whole family, the puppets perform a zany variety show of songs, skits, jokes, games and comical interaction with the audience. It’s interactive and live (rather than pre-recorded). 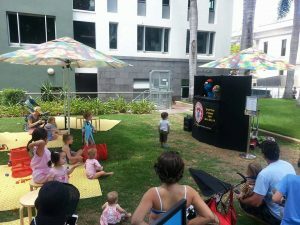 Kids are encouraged to sing and play along. 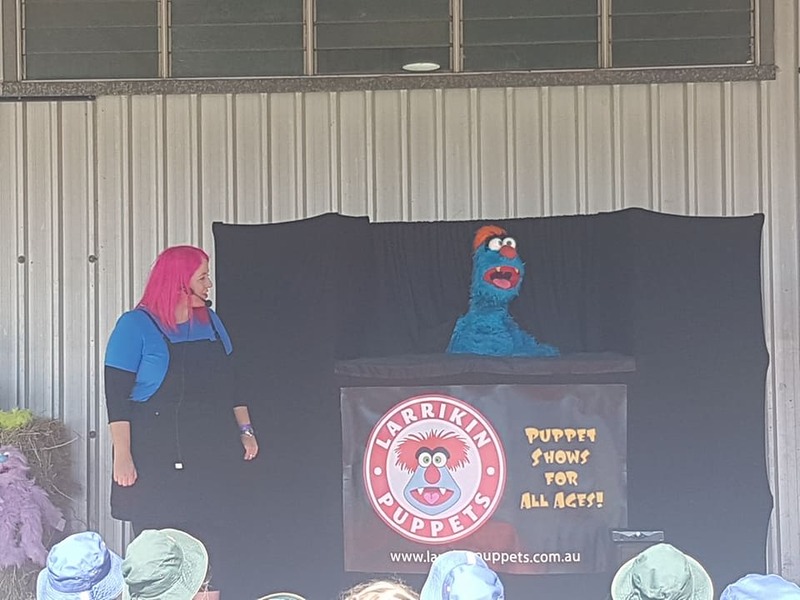 The finale of the show has us teaching six volunteers from the audience how to operate some backup singer/dancer puppets for the final song. 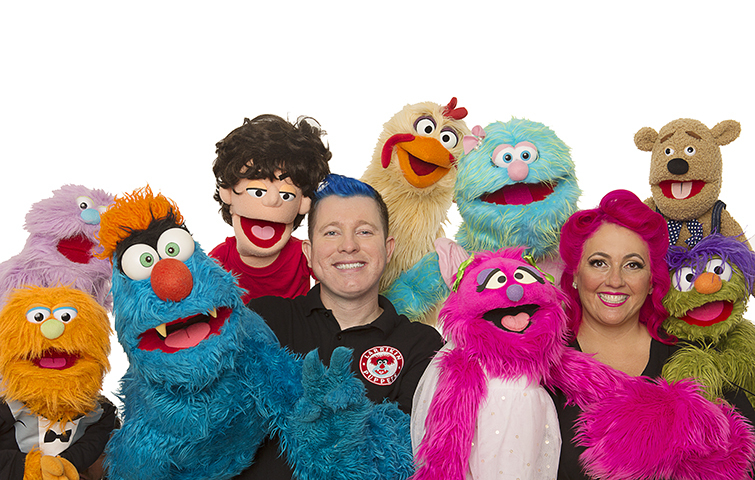 After the show: We will be available to do a 5-10 minute meet and greet and photo opportunity with Troggg the blue monster and other puppets. 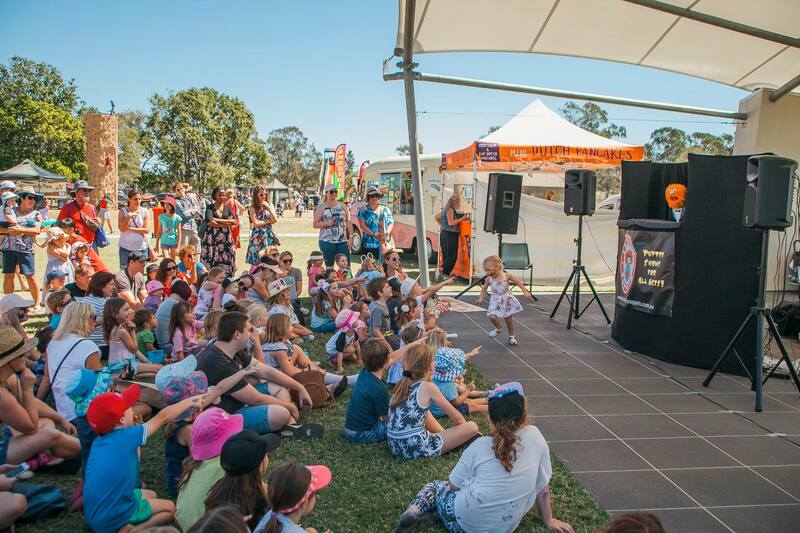 Sunshine Coast Teddy Bear Fair (QLD), May 2017. 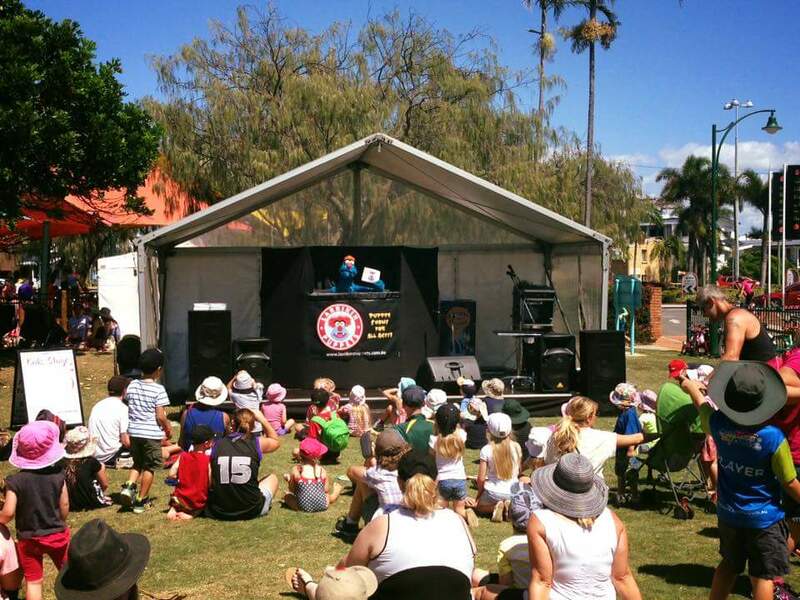 Redcliffe Sails Festival (QLD), March 2016. Woodford Folk Festival (QLD), Dec 2016. – 30 minute puppet show of songs, games, jokes and comical interaction with the audience, including six audience volunteers to perform with puppets in the show’s finale. 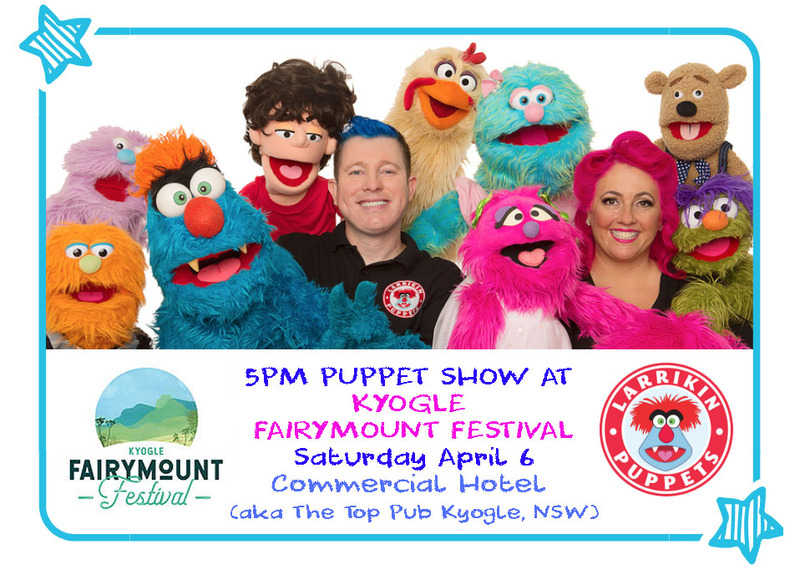 – 5-10 minute Puppet meet-and-greet / Photo opportunity with Troggg and Flossy. – Time allowance for travel to and from, set-up and pack-up of the puppet stage, props, puppets and sound equipment. Brett wanders around events with Troggg the blue monster and/or Moss the green monster. Elissa wanders around events with Flossy the pink monster. Guests can chat and mingle with Troggg/Moss/Flossy, and get their photo taken with them. 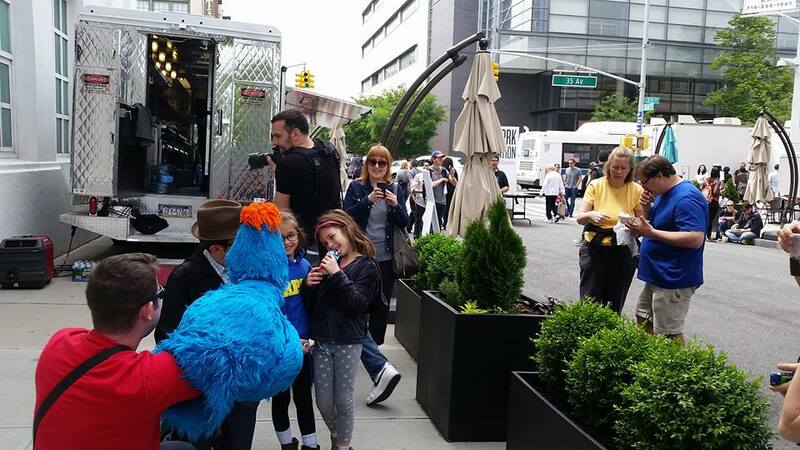 – Time allowance for travel to and from the event, set-up and pack-up of the puppet stage, props, puppets and sound equipment. Woodford Show (QLD), June 2017. We’ve completed three months of professional development in the USA, which included advanced, formal training with Jim Henson puppeteers from The Muppets and Sesame Street. Gin Gin Family Frolics (QLD), March 2018. We have current Blue Cards (Brett’s number is 1161011/2, Elissa’s is 690261/2) and are fully insured with Public Liability insurance through “Duck For Cover” entertainers insurance. These documents can be attached to an email, should you need them. 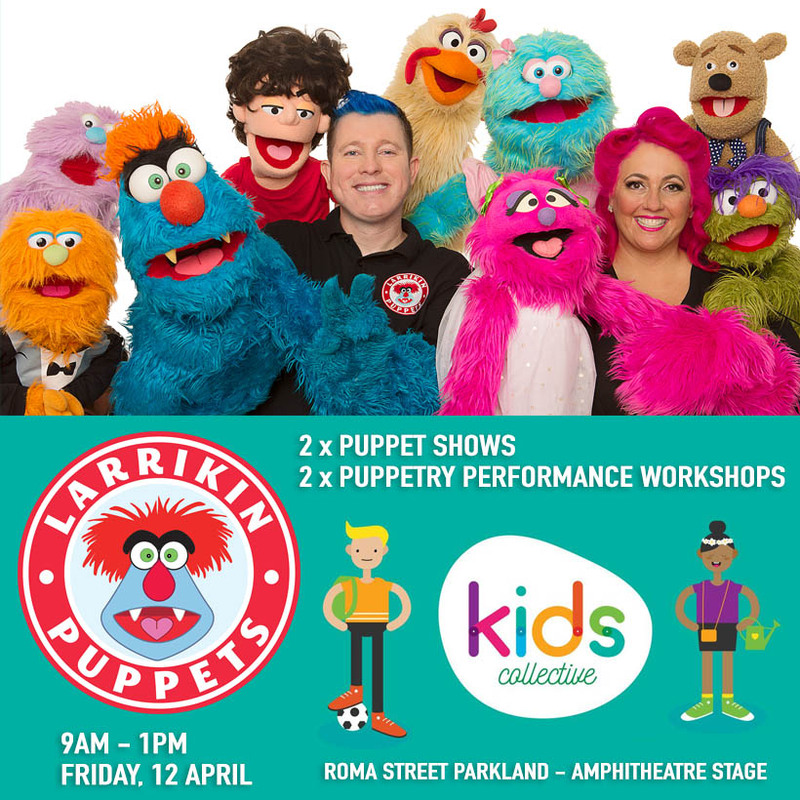 Larrikin Puppets is also listed on the Brisbane City Council Creative Register. Gladstone Harbour Festival (QLD), April 2018. 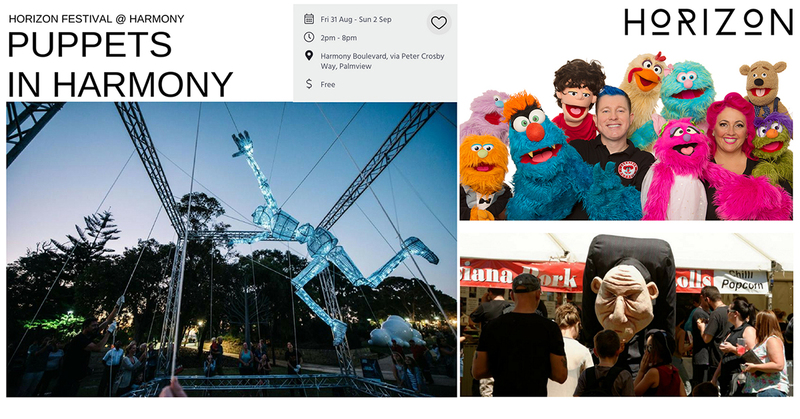 For festivals where we are set up for a day of performances, it usually takes a bit over an hour to set up the puppet stage, props, puppets, sound equipment, and our pipe and drape backstage area. 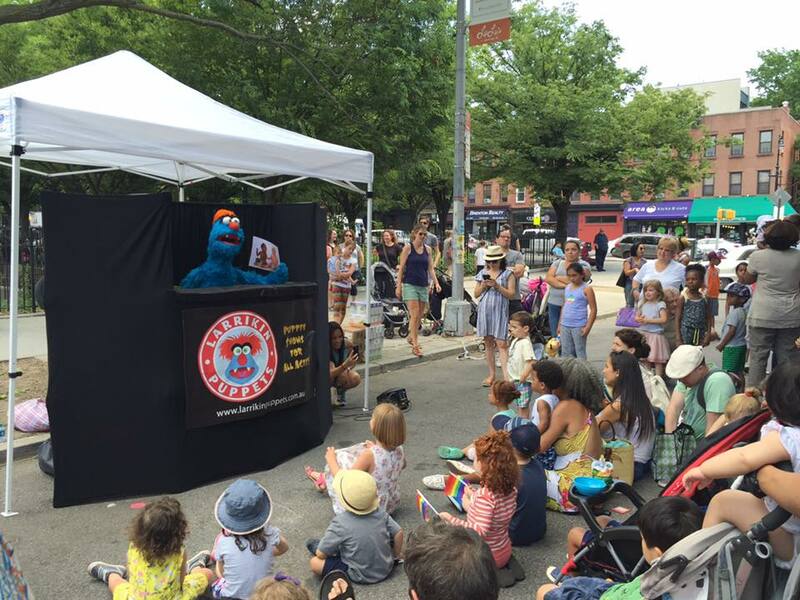 It’s a portable puppet stage with an overall height of 1.8 metres, and an overall length of 2.4 metres. The puppet stage is only a front-on facade. Behind it is our pipe and drape system which measures about 2.5 metres behind the puppet stage. This is where the puppets, props, and puppeteers go for performing. For festivals where we are an act that bumps on and off the main stage between other acts, we set our puppet stage up backstage or to the side of stage ready to quickly carry up onto stage and spend two minutes laying out our puppets and props, and quickly testing the wireless headset mics and music/sound before the performance. The pipe and drape backstage area is not used for our strike on/strike off mainstage performances between other acts. 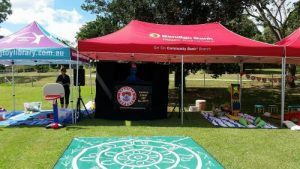 Moorooka Festival (QLD), May 2015. For music and sound effects, we use our own set of large PA speakers which we plug in an iPod and our wireless headset mics. 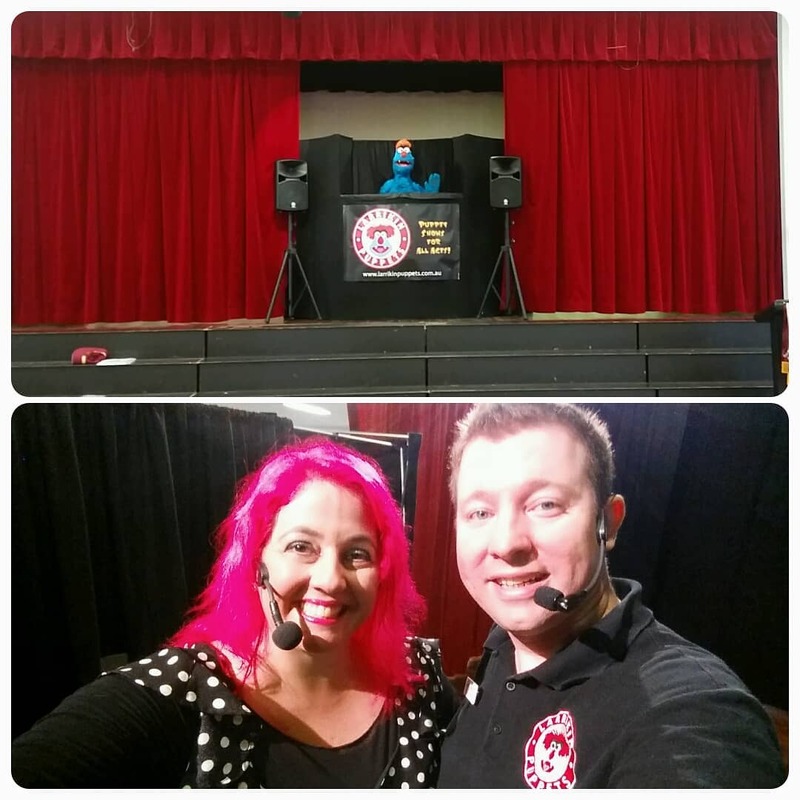 These large PA speakers are great for events where we are set up in one spot for a whole day of performances. A powered site is required for this. For festivals where we are an act that bumps on and off the main stage between other acts, the event often has a sound technician who provides us with wireless headset mics to plug into the event’s main PA system to project to larger audiences. The sound technician also provides us with a D.I. box (direct input) to plug our iPod of music and sound effects into. We need to be able to access our iPod from behind the puppet stage, as we start and stop it ourselves throughout the performance. 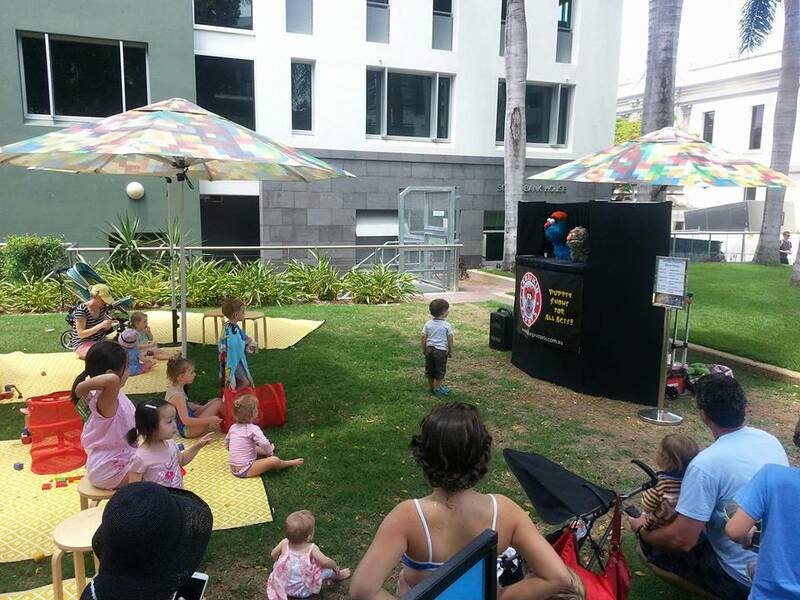 Little Days Out at South Bank (QLD), 2015. If there are any other queries, please feel free to have a look at the FAQ page, outlining everything anybody could wish to know. And our Terms & Conditions, including a bit of information on adult supervision (or crowd control) during the performance. Caboolture Family Fun Day (QLD), 2017. 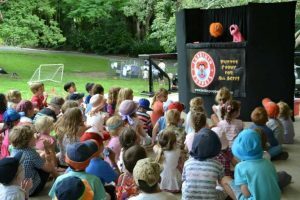 On the Day: Puppeteers arrive about 1 hour and a half before the puppet show’s starting time to park the vehicle, load in all of the equipment to the performance space, set up the stage, sound equipment, props and puppets. 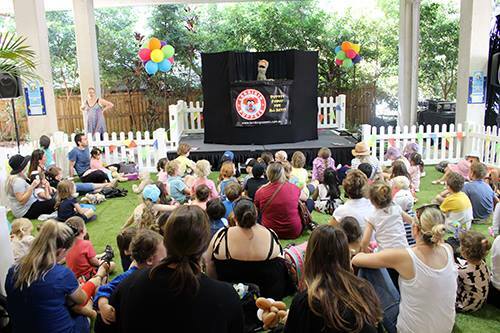 The show (as described above) is performed for 30 minutes, followed by a “How the puppets work” demo and a meet-and-greet/photo opportunity. The puppeteers then pack up all the equipment. 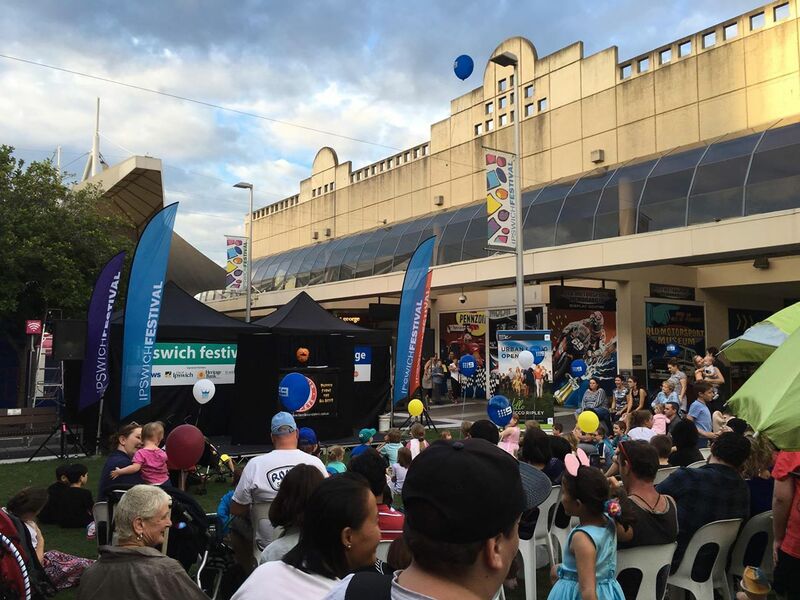 Ipswich Festival (QLD), April 2016. 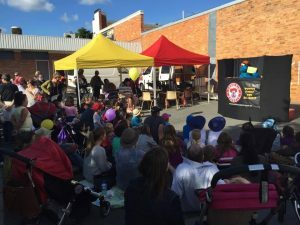 The Gap State School Fete (QLD), August 2018. 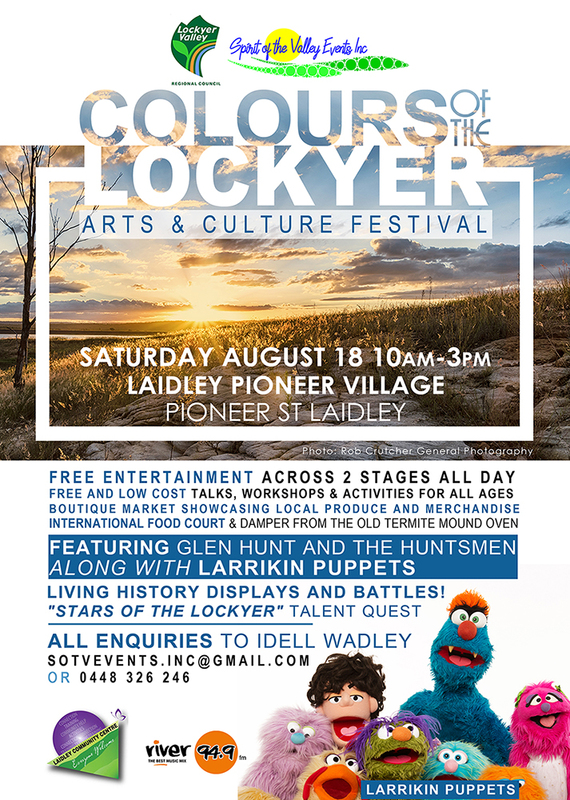 Colours Of The Lockyer Arts & Culture Festival, Laidley (QLD), August 2018. 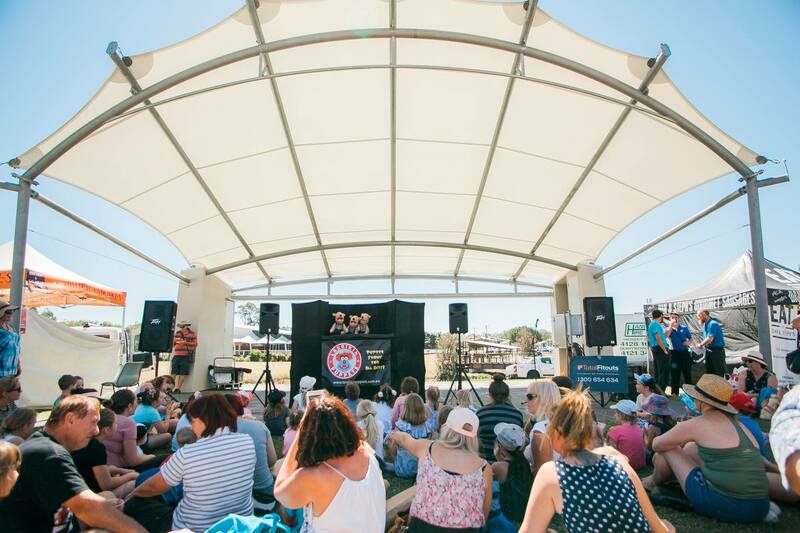 Horizon Festival, Sunshine Coast (QLD), August/September 2018.